Heat magazine is the UK’s most famous weekly magazine for celebrity gossip - which asks celebrities all the questions nobody else dares to ask! With an undoubtedly witty tone and an unshakeable dedication to the joy of gossip, it comes as no surprise that it’s a favourite amongst guilty gossip fanatics. Fuel all your gossip needs with Heat magazine and be treated to the latest news, views and announcements from the glittering world of celebs. With exclusive features written by an award-winning team, Heat provides unprecedented coverage of all of the biggest names. Stay up-to-date on the current fashion trends and discover what’s hot and what’s not before anyone else! 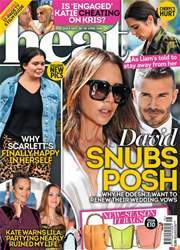 Famous for its unique sense of humour and witty perspective, Heat magazine is the must-have weekly digital magazine subscription. Treat yourself to a giggle today! Behaving with dignity and decorum has never exactly been Katie Price’s forte, but even she still managed to shock us with her antics last week. After being cleared of drink-driving, a jubilant Katie appeared on the steps of the court, acting like the innocent victim and punching the air in victory. But, in fact, she had been found guilty of being drunk in charge of a vehicle, following a night out to celebrate boyfriend Kris Boyson’s 30th birthday last year. And the judge made it clear it was only because there wasn’t enough evidence to find her guilty of drink-driving and told her she wasn’t a “plausible or credible” witness. Heat magazine (also known as Heat World), was published by Bauer Media Group in 1999 and has become the source that fuels the scandalous conversation about the celebrity world and set popular culture alight! Initially launched as a general interest entertainment magazine, a couple of revamps later, it rebranded and repositioned itself as a gossip orientated magazine which didn’t take itself too seriously. The rebrand of Heat magazine was timed to coincide with the launch of a commercially successful reality TV show, Big Brother. By jumping on the hype of this show and launching covers with Big Brother contestants alongside focused content on the show, circulation quickly grew - now with a regular circulation of over half a million! This gossip focused mag created its own individual tone of voice which women gravitated towards as they revelled in the scandal which often engulfs the sparkling celebrity world. Featuring everyone you need to know about in the world of entertainment, from famous faces across film, TV and music industries to the d-list celebs whose faces you recognise but names you don’t know about yet.